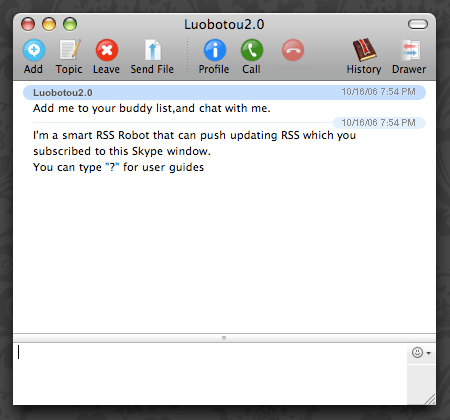 Check out RSS Robot, a pretty innovative use of Skype for being notified of new feed content. For example, try pasting this RSS + https://factoryjoe.com/blog/feed into the chat window. Should be a nice complement to Tailrank’s new IM functionality. Chris, How many feeds can you add? Pingback: pimpyourwork.com » Blog Archive » Try the RSS bot for Skype! Note that the bot is no longer called luobotou2.0. The new bot is called anothR.com. You can also find it by searching for “RSS Robot” in the Skype contact search dialog box. I’ve updated my blog post at http://www.cleverclogs.org/2006/10/skype_rss_reade.html accordingly. Please submit comments to other blog posts on the web if you happen to stumble across them so that people know the information we found first is outdated. @Marjolein: Thanks — will do.